In 1927, the poet Wang Guowei threw himself into the murmuring waters of Beijing’s Kunming Lake, never to be seen again in the first world. 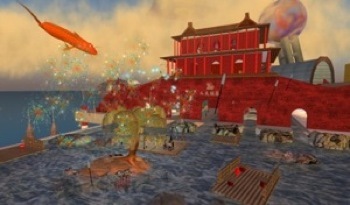 Now, almost a century later, a rumor is afoot: was that Wang Guo Wei’s avatar that was recently spotted in Second Life? 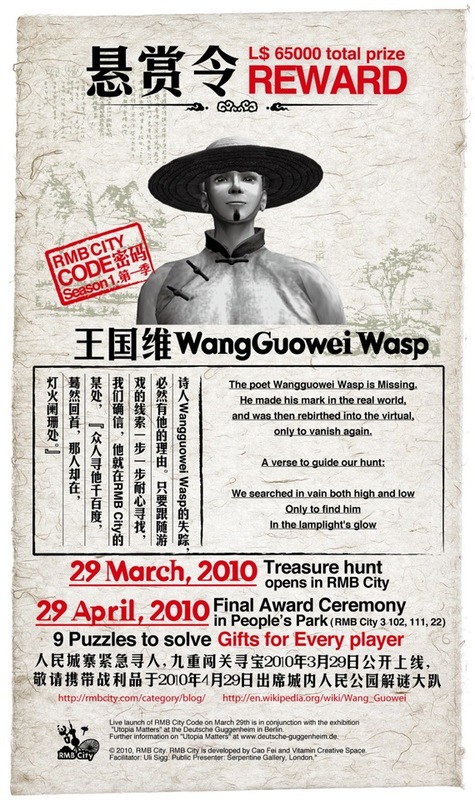 Yes, “Wangguowei Wasp” was seen in RMB City, only to swiftly vanish once again, leaving a trail of clues in his wake. 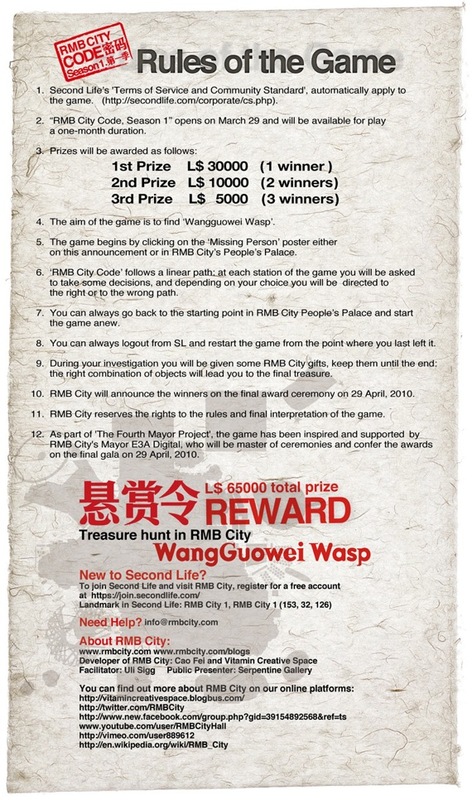 Beginning on March 29, 2010, and for one month thereafter, you can become a Second Life detective and help to solve the mystery of his latest disappearance This compelling mission will involve exploring the most secluded back alleys of the island and interacting with the most mysterious characters in all of RMB City. A curious eye and open-minded heart will help you to unearth Wuang Guowei’s secret. At the end of the game, the most intrepid explorers will be awarded with an unexpected prize. 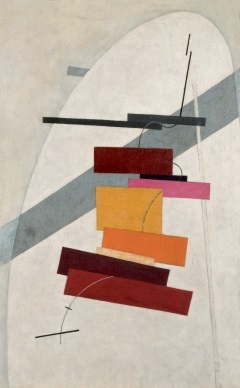 “Utopia Matters” at the Deutsche Guggenheim in Berlin. 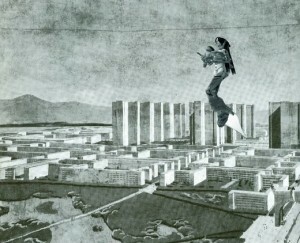 Dressed in her shining armor, the futuristic silhouette of China Tracy flies over LeCorbusier’s modernist plan of the utopian city ‘La Ville Radieuse’, sketched by the great Swiss-French architect back in 1935. 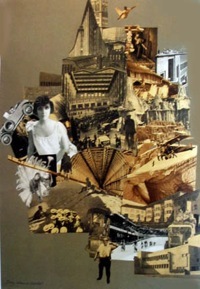 The inspiration of this very rudimentary collage (I must admit I’m still very unskilled in graphic design) came to me from the title of the ongoing exhibition at Berlin Deutsche Guggenheim, featuring works from both RMB City project and the post WW1 Bauhaus movement (http://rmbcity.com/2010/01/rmb-city-at-utopia-matters-deutsche-guggenheim/). 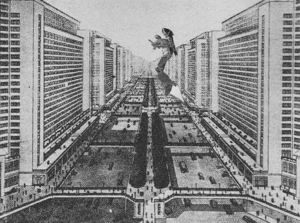 The German Post-War architecture school responded to the conditions of its historical moment with a form of idealistic functional utopia, promoting an ideal unity of method and design, of art and technology, and imagining a utopian urban planning with ordered streets, a rational and systematic optimization of space, and some set rational ‘International standards’ for the new living culture of the 20th century. Almost one century later, architects and urban planners still have to cope with similar problems of urban developments, facing an even more complex postmodern industrialized landscape, a chaotic standard of living, an increased mobility and new ecological challenges. On some aspects, Cao Fei’s Utopia retraces the same path undertaken by the Bauhaus school, specifically with regard to the general interpretation of the term ART. 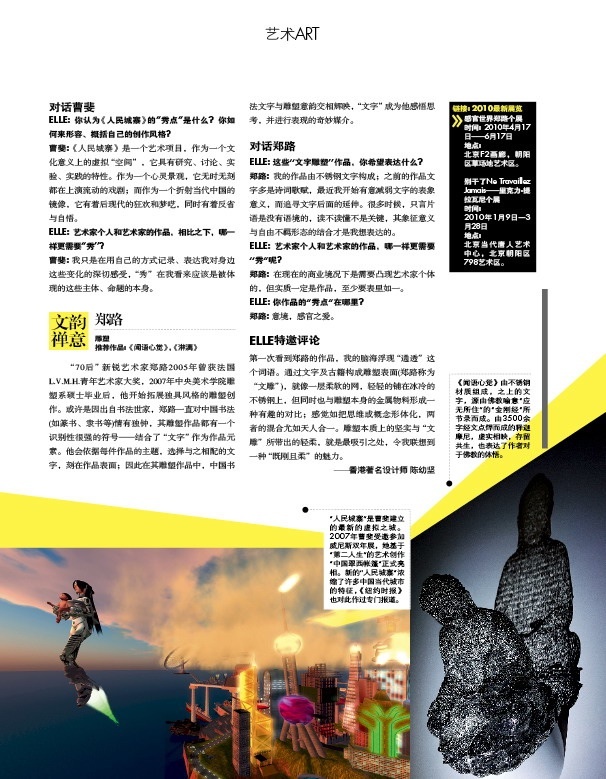 Snobbery and formalism are alien to Cao Fei’s works, too, and similarly to its German precursors, RMB City also promotes an idea of unity of art and technology and an understanding of an artistic project as a collaboration between diversified internal and external sources. RMB City motto: ‘My City is Yours, Your City is Mine’ somehow thus reintroduces the idea of the Bauhütte, a premodern guild of stonemasons and co-workers. 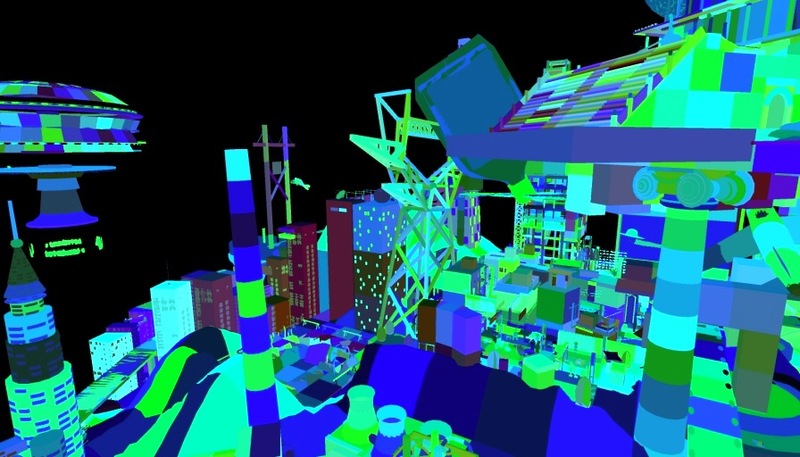 Cao Fei’s city is however a much freer and ‘impurer’ world, where opulence and modernity cohabit with the old and dirt, the sacred mixes with the profane and fantasy overlaps reality. The faultless order of ‘La Ville Radieuse’ becomes a joyful carnival of heterogeneous elements in RMB City, where vitality and energy take shape in many different informal ways and set the stage for a different utopia. The Solomon R. Guggenheim Museum invited Cao Fei to imagine how she would ideally utilize their iconic museum building in New York to stage an artistic concept. 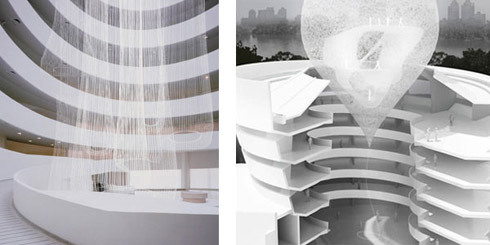 Envisioning Frank Lloyd Wright’s eccentric space as a yak horn, she built the Guggenheim in RMB City as a dynamic horn-shaped building. Drawing upon a Tibetan legend about being unable to fit a large ego into the horn, the Guggenheim in RMB City is a manifestation of the concept of “nothingness” and harmony in the context of the real and virtual worlds. Inspired by the void in the Guggenheim central rotunda, Cao Fei envisioned her virtual and intangible museum, an ephemeral building transforming into a yak horn floating in the air. A homage to the vast power of imagination, creating ‘worlds’ out of emptiness, the work is also a reflection on the meaning of intangible spaces and virtual realities such as SL. Until April 28, 2010, a photographic series of the Yak Horn will be on display at the Guggenheim as part of the exhibit “Contemplating the Void”.